I really love to spoil a guest when I have them and that means to switch things up to make it easy for them to function and enjoy their stay. We have a guest that needs to have an office set up so they can work from our home when they are here. So I am eager to accommodate if at all possible. I set out to add a desk area to this small guest room and do it for free. A file cabinet for a night stand. It was at least clean and the bed was comfortable and had fabulous linens. My buffet worked great for a dresser too. Then I found a headboard that I could makeover at Hotel Liquidators for $29.50 so that prompted the start of a makeover. 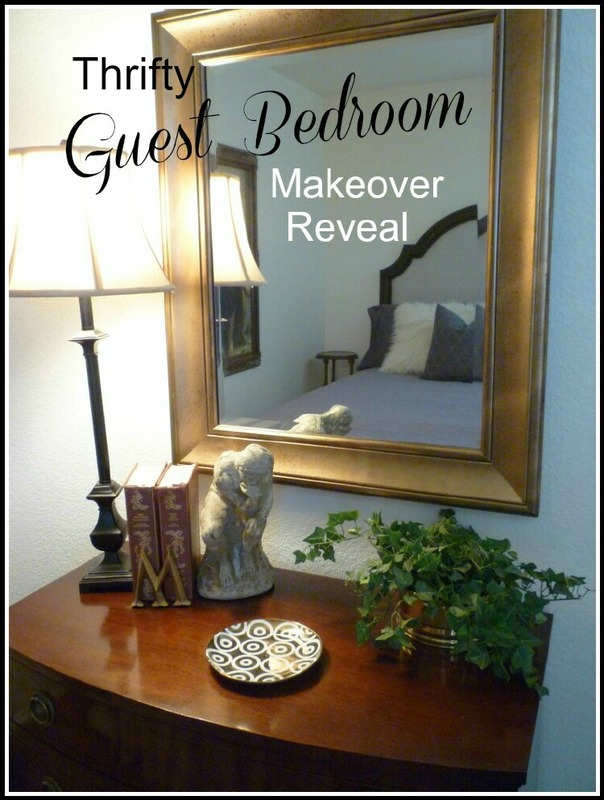 Thrifty Guest Bedroom Makeover Reveal. 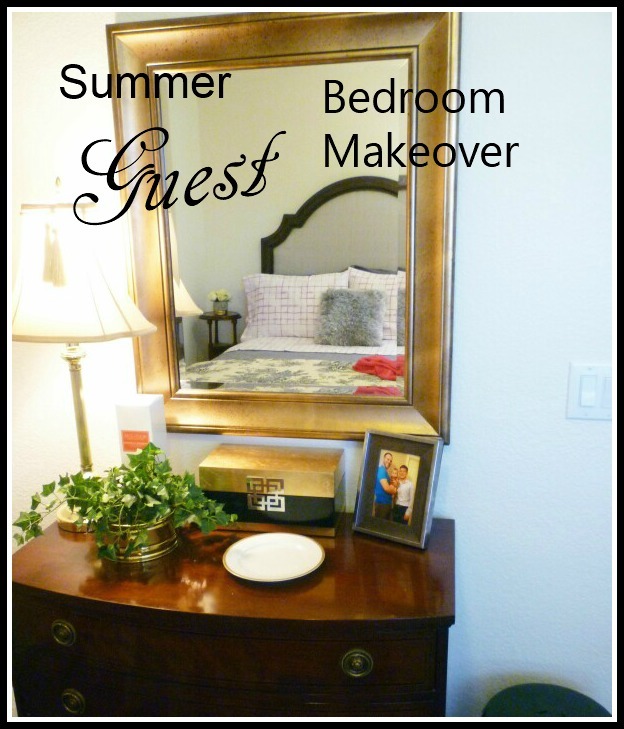 I did some more thrift shopping and came up with a small chest for a nightstand and a fabulous dresser from my favorite 2nd hand store. You know how things go, then I removed the chest and added a nice chair. I thought our guest would like a nice place to sit. That was the final switch I made. That brings us up to now - New linens and a small office for the Guest Bedroom. Laura @ Duke Manor Farms had a giveaway of a set of sheets and I won. I love them and they are such beautiful soft sheets too. Plus the pink plaid is so perfect for my room. Getting these was the perfect time to redo the bed and lighten things up for summer. Adding the splash of pink to the room totally changed the look and now I think it is so much more inviting. Love the pink. Thanks again Laura, these sheets were the push I needed to make some changes. The pink is so pretty with my grays and it adds a cheery and inviting punch of color. I did away with the blankets and just kept the lightweight gray quilt. The comforter at the foot of the bed can be pulled up if they get cold. I added a pink throw to use as a cover for a nap. A makeshift desk was next on the list. I removed the chair and added in a 4ft. folding table from the garage. This is large enough to hold papers, the keyboard and mouse and still have some work space. An extra office chair makes it a really comfortable place to work for several hours. The dresser at the foot of the bed has a couple of empty drawers for our guests to use too. Not the prettiest office, but one that will handle all of our guests needs. All in all I think it looks comfy and inviting too. (Maybe I need to look for a small desk as a permanent piece. A really cute office chair would be great too.) Guests could use them as a desk or a dressing table. Ok, the hunt is on for something fabulous and economical. 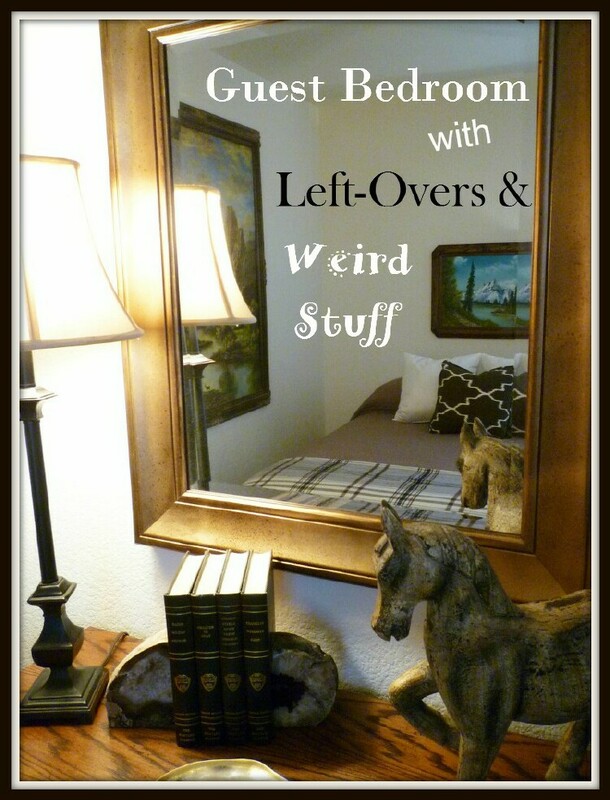 How do you switch up things to make your guests comfortable? Oh the sheets ARE so pretty! Beautiful guest room! I think that your brass “M” is actually a W that is upside down; it is sometimes hard to tell, but I thought that you would want to know. Fun to see the transition. My guest room is full of yarn - no room for a bed, hehe.